1. This small and modern study has bright yellow supports that hold the white wall shelves and floating desk in place. See more photos of this project, here. Designed by Gray Puksand. Photography by Shannon McGrath. 2. This small patio area with seating is shaded by the shape of the home. See more photos of this house, here. Designed by Thomas Löwenstein. Photography by Alejandro Gálvez. 3. Clerestory windows allows light to bounce off the concrete walls and ceiling making the room brighter. 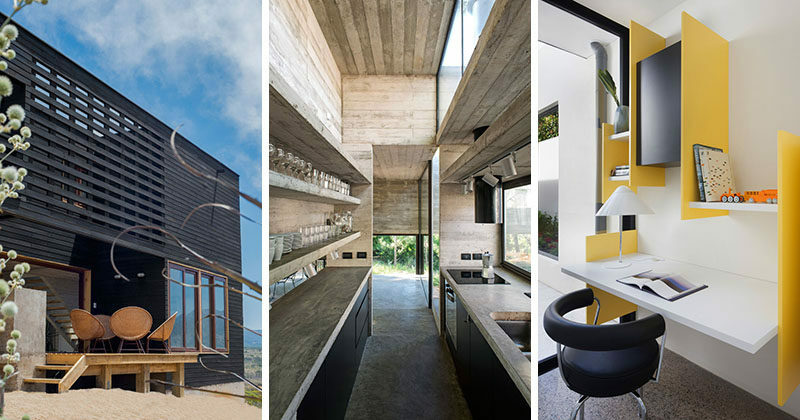 Matte black cabinetry match the black window frames throughout this modern house. See more photos of this project, here. Designed by Luciano Kruk. Photography by Daniela Mac Adden. 4. 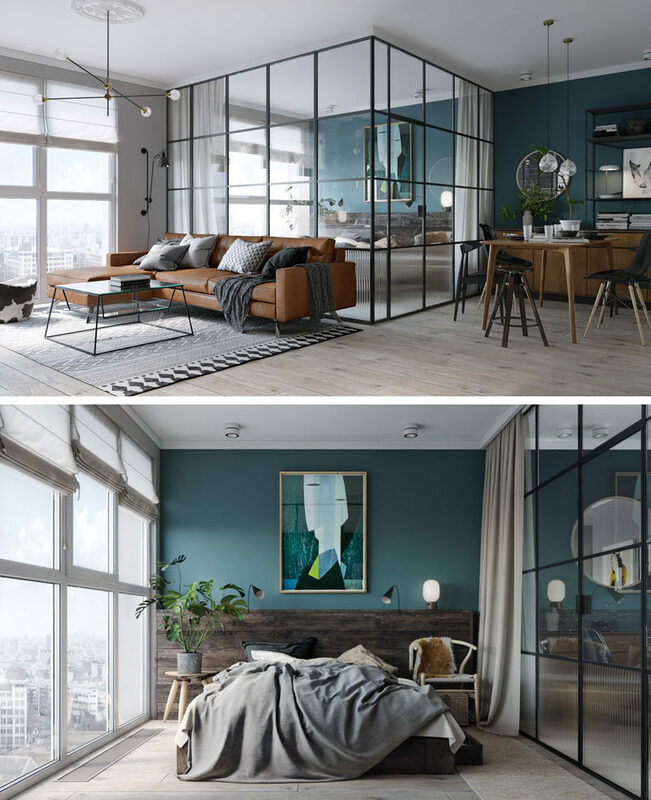 In this small and modern apartment, the bedroom has a deep teal and wood accent wall providing the perfect backdrop for the artwork and bed, while black framed glass walls separate the bedroom from the living and dining area and allow the light from the windows to travel throughout the small apartment. At night, blinds and curtains can be drawn to provide privacy. See more photos of this apartment, here. Designed by MARTINarchitects. 5. This outdated kitchen was transformed into a brighter happier space by opening it up, changing the light fixtures, upgrading the appliances, and adding a central island which helps connect the kitchen to the other areas in the home. See more photos of kitchen makeovers, here. Renovated by Balodemas Architects. Photography by Anice Hoachlander | Hoachlander Davis Photography.